Like all good science experiments, began with — in this case, a failing burrito shop. In 2004, Naomi and Jerry Hancock realized too late that they’d failed to follow the first rule of business success: , location, location. Their burrito franchise in Orem, Utah, was poorly placed, and as a result, the business was hemorrhaging $4,000 per month. When they asked the few customers they had what else might draw them back, the answer was unanimous: ice cream. But in a market crowded with soft-serve, frozen yogurt, gelato, custard, Häagen-Dazs, Cold Stone Creamery, Ben & Jerry’s and dozens of other permutations of ice cream, the Hancocks wanted to stand out. That’s when Naomi came across an article in Popular Science about liquid nitrogen used with food. She showed Jerry, who has a chemistry degree and some experience with industrial design, and the wheels started turning. Most people know liquid nitrogen from Bill Nye, the Science Guy-style demonstrations, where someone freezes a rose or a marshmallow with the minus-320 degrees Fahrenheit liquid before smashing it to smithereens with a hammer. The Hancocks realized they could mix anything they wanted into a liquid ice cream (akin to the stuff poured into soft-serve ice cream machines), then blast the concoction with liquid nitrogen, creating almost any flavor imaginable in minutes. As a bonus, the process, which creates clouds of rolling fog, looks pretty cool and futuristic as well. 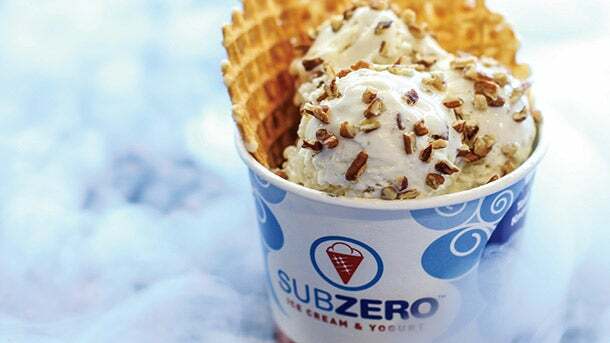 Sub Zero Ice Cream and Yogurt uses liquid nitrogen to whip up dessert on demand. The Hancocks added the first Sub Zero ice cream counter to their burrito joint, slowly perfecting their recipes. Eventually they settled on a yogurt base, a low-fat base, and vegan, lactose-free and sugar-free versions to accommodate almost any dietary need. The liquid nitrogen came from military surplus. “We’re probably the only people to use government surplus to build an ice cream company!” Naomi says. Customers loved it, and not just because of the fog. They could custom-design their own ice cream flavor, and the end product is a dense, creamy ice cream with no air whipped into the mixture (a common practice used in factory-produced ice cream). Four years later, they were able to open their second Sub Zero shop in Utah, and then the couple began . However, there was one issue holding them back from expanding as quickly as they’d hoped: gas. As it turns out, the liquid nitrogen industry is something of a cabal. Many national gas brands refuse to sell the product to small users for liability reasons (the liquid can be dangerous if not stored and used properly) and regional producers are overly cautious as well. Before the Hancocks could seal the deal on a new franchise, they had to persuade a local liquid nitrogen producer to supply their franchisee. It was a laborious process, but over the past eight years they’ve opened 51 units in the U.S. and another three internationally. Recently, Sub Zero’s long record convinced the national company Airgas to supply their needs nationwide. Next post › These Millennials Are Running Franchises With Their Parents. Here’s What They’ve Learned.